Can I Take Vitamins If I Am Taking Antibiotics? Although they aren't medications, vitamins may cause an unwanted interaction if you are also taking antibiotics. 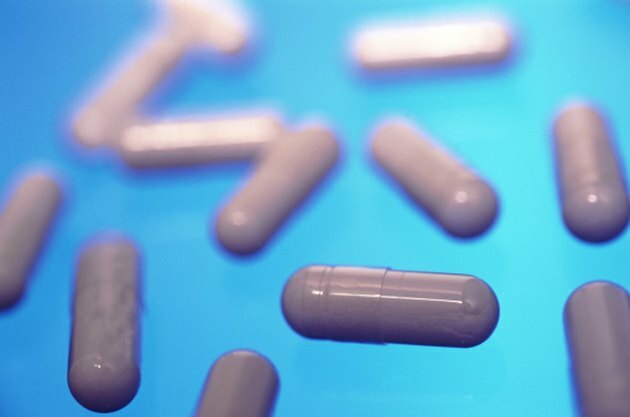 In some cases, taking supplements with antibiotics may have a beneficial effect. While discussing how to use an antibiotic with your physician, let her know what supplements and medications you are currently taking to decrease the potential for an unwanted interaction. Vitamin C is used to increase the effectiveness of your immune system. Vitamin C appears to enhance antibiotic effectiveness and reduce recovery time. The University of Maryland Medical Center states that vitamin C can increase concentrations of the antibiotic tetracycline in your body and can subsequently reduce the effectiveness of the vitamin, however. UMMC explains that this effect also occurs with other members of the tetracycline family of antibiotics, including doxycycline and minocycline. Vitamin B12 is used by your body to turn food into fuel, maintain the integrity of your neurological system and grow healthy hair and nails. Avoid this vitamin supplement if you are currently taking a tetracycline-based antibiotic, according to the University of Maryland Medical Center. Vitamin B12 impairs the efforts of the antibiotic to kill the source of the infection. Additionally, other members of the B-complex family of vitamins can have a similar effect and should either be avoided while taking tetracycline antibiotics or taken several hours before or after taking the antibiotic. Check with your doctor about protocols when taking a tetracycline-based antibiotic and vitamin B supplements. Vitamin K is used in blood clotting, helping wounds stop bleeding and begin healing. UMMC explains that taking antibiotics can sometimes destroy the bacteria in your body that help it manufacturer vitamin K. Members of the cephalosporin family of antibiotics can also impair your body's ability to absorb vitamin K, particularly if you take these antibiotics for more than 10 days. The elderly and individuals taking blood thinning medications are most at risk for this type of deficiency. If you are taking a vitamin K supplement and are being prescribed an antibiotic, discuss the potential interactions with your doctor. Vitamin D, which is found in fortified foods such as some cereals and milk products, helps maintain proper levels of calcium and phosphorous. Vitamin D helps manage your immune system and may be taken in conjunction with antibiotics to increase the efficacy of the antibiotics. Taking vitamin D, along with vitamin C, niacin and antibiotics helps in the treatment of bacterial infections. Discuss this plan with your doctor prior to mixing Vitamin D and any antibiotic prescribed.